Measure2CAD is a stand-alone software for measuring objects and capturing physical dimensions. Using a measuring arm, Meausre2CAD turns your CMM into an easy-to-use digital measuring tool. 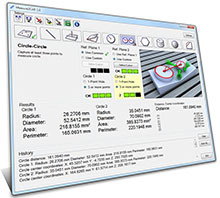 Probing 2D features (slots and circles) and 3D features (spheres and cylinders) are only some of the measurement tools available in Measure2CAD. You can try out Measure2CAD for free with a 14 day long trial License. You can issue your trial Measure2CAD license from the Measure2CAD software. Warning: You must issue a Trial License to be able to upgrade it to a Premium License and to purchase support for that License. To purchase a Premium License or to add support for that License visit your License Manager. Start Measure2CAD and request a trial license. Read the User Manual and watch the video tutorials to learn Measure2CAD.